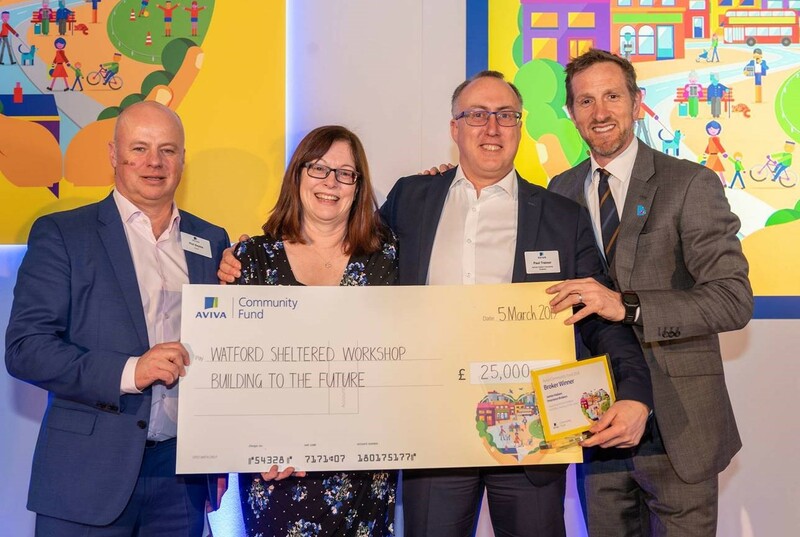 James Hallam, Watford’s very own specialist insurance brokers is delighted to announce that its nominated charity, the Watford Workshop has been awarded a fantastic grant of £25,000 by the Aviva Community Fund. The cheque was presented to them by Phil Bayles Managing Director Aviva Intermediaries and Will Greenwood OBE. The Aviva Community Fund is designed to help and improve the delivery of locally based community projects through a series of grants with this year’s total prize pot totalling £261,000. This year, over 180,000 votes were cast to identify projects that could best benefit their local communities and in total, 81 finalists were shortlisted to receive grants of between £500 – £25,000. The Watford Workshop was nominated by James Hallam’s’ Watford Office and was one of just three national finalists to receive the highest award of £25,000. “It was important for us to nominate a community project that reflected our business ethos” says Paul Trainor, Divisional Director of James Hallam. “As soon as you walk through the door you can see how the Workshop is transforming lives and making a real difference to our local community. The Watford Workshop is designed to increase the self-confidence and social skills of adults with learning difficulties and disabilities. Real work experience and skills training helps to improve both their self-esteem and qualifications and as such improve their opportunities for mainstream employment. The Watford Workshop is a hugely valuable local community asset but like similar community projects is heavily oversubscribed. Its ability to deliver its program and meet demand is severely restricted by the limitations of its building. The grant will go towards the building of a brand new mezzanine floor, thereby increasing the Workshop’s capacity and ability to help even more local people. “The awarding of this grant is a really significant moment for the Workshop” say Linda McIntyre CEO of the Watford Workshop. “We would like to thank the Aviva Community Fund for this most generous grant and of course James Hallam’s nomination and continued support”. Pictured: Phil Bayles, Managing Director Aviva Intermediaries and Will Greenwood OBE presenting Linda McIntyre CEO, Watford Workshop and Paul Trainor Divisional Director of James Hallam with their £25,000 grant.